Our simple, flexible options allow you to spread your messages over an unlimited number of connected devices, delivering an ultra low per-device cost. Secure, long battery life IoT connectivity for 1c per message on our Go Large plan. Going straight to scale? Our Go Large plan provides a 1MB monthly data quota which can be spread over any number of connected devices. Your message costs can be as low as USD $0.01 per message. Planning to start with a pilot program, or just got a small device deployment? Our Ramp Up plan provides a low per-message cost at medium scale. Get 200 kB per month to use over any number of connected devices. Just getting started, or only need infrequent messages per device? Our Get Started plan will get you up and running at minimal cost. Get 20 kB per month to share between any number of connected devices. Your Data, Your Way. Not sure exactly how many messages you want to send per day? Need to send sporadically (nothing one month, everything the next). Want to ramp up your deployed devices slowly? This is the plan for you. With our Flexi Message Block plan, you have 12 months to use your messages, and you can use them at whatever rate suits you best. Your Myriota Module is the foundation for globally connected IoT products. It is ultra energy-efficient, and securely transfers data to our constellation of low earth orbit nanosatellites. 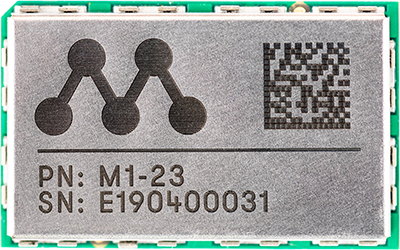 Built on an edge computing platform, the Myriota Module also provides a microcontroller, memory and standard interfaces for integration with third party sensors.